Today security is one of the key aspects in our daily life - sometimes conscious, sometimes unconscious. Security has many aspects and one of them is computer security or security of your or your business' computer data. In this tutorial I will show how to encrypt a whole disk drive using (X)Ubuntu Feisty, dm-crypt, and LUKS. This tutorial will destroy any data on the harddisk that you use. It is adviced to be very careful which harddisk you enter. 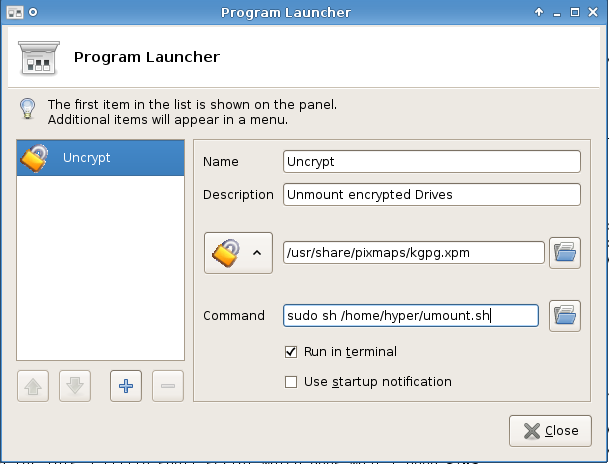 Do not use it to encrypt your harddisk where you have Linux installed. The primary aim is to encrypt an additional harddisk that is used for data storage. There are other encryption methods available. Foremost probably to mention is true-crypt which offers a greater extend of plausible deniability by having two levels of encryption. The idea behind that is, that if someone sees that you have a large drive/partition with only jitter on it that sort of looks like deleted data this person may come to the conclusion that it is an encrypted partition/drive. In this case you may be forced (by a judge or some bad-guys) to reveal the access to that encrypted partition/drive. So instead of giving access to the really high confidential data you only give access to less confidential data. This inspector can't tell for sure if that is truly all information on that disk. However for me plausible deniability is not that important. Living in Europe in a country that has ratified the European Charter of Human Rights I have basic freedoms granted to me among the right to remain silent without facing any negative consequence (well, this only plays a role in criminal proceedings). This means a court ordering me to give out the password to activate the encrypted drive has no negative consequences for me. If it does anyway I can appeal to the European Court of Human Right, residing in Strasbourg, and very likely it will consider such an act as breach of the Charter and convict the according state. While in criminal proceedings it must be proved that you as an individual did commit a wrongful act it is different in civil law proceedings. In some countries you can be held liable for the information that passes through your internet account without you knowing that this happens and without you doing anything. In that case no evidence on your harddisk will be needed (well, if there is evidence found, it's even better...) and hence an encrypted drive will not protect you in this matter. Due to this I concentrate myself on encryption provided by dm-crypt and LUKS which does not offer such advanced plausible deniability with multi-levels of encrypted data. * Notice: As I am a graduate law student here in Switzerland I can mostly speak for legal considerations concerning Switzerland. In other countries (in Europe) it may be a bit different but the basic principles and their effects for the guaranteed freedom of people in contracting states remain the same. Also the terms I used very likely aren't the correct legal terms in English however they should be looked at as a mean to get the idea accross of why I think that multi-level encryption has not a big impact here in Europe. The above statements are in no way to be considered as legal practice as each case is different. As stated above, I use Xubuntu Feisty for this. This may also work on older *buntu releases and very likely also other debian-based distributions. Replace HARDDISK with your actual one e.g. hda or hdb or sda or sdb or .... however it's recommended to first make a partition on there and then encrypt that partition. Even if the partition will entail the whole harddisk. This will quite take a while. In order to make use of dm-crypt we have to load a few kernel modules. fuse and lp were in my file by default. It may be, that yours doesn't have those two in there or additional ones. Just add aes, dm-crypt and dm_mod to this file. Exit nano by pressing ctrl-x. You will then be asked if you want to save the modified file. Hit Enter twice. Once for saving it and once for setting the name of the file. Upon boot you will be prompted to enter the password you have assigned to this encrypted device. You will be asked max. 5 times if you enter the wrong one retry=5. If you fail to provide the correct password the system will boot without mounting that drive. You can however still manually mount it. See above section VIII. You can add more keys to an encrypted partition or also remove keys. With the dmsetup command you can display devicemappings. Is one of them active then anyone can access it, even if it is not mounted. You just need to have to necessary rights. In this state the device is sort of decrypted. I created for this a little shell script which does what I need. Well, now you have your own encrypted partition. You can have a look at the different switches for dm-crypt and luks and maybe use some alternate. I used in this tutorial a complete harddisk as I had problems achieving the setup with just a partition on a harddisk. However I didn't try too hard as I wanted my whole harddisk encrypted. If you power down the computer or just cut the power off then the harddisk will become unmounted and the mapper will be removed. Enjoy! IANAL but the concept behind "The basic idea is that having encrypted the data probably indicates you knew the data was illegal" goes back hundreds of years. It's called a badge of criminality. The law tries to look into your mind. If the most likely reason for you encrypting something is that it's illegal, then that encryption is a crime. However, if everything were routinely encrypted, then that reasoning would not apply. Très bon guide merci ! Right. However, you should know that many countries in Europe have circumvected this. I am sure for France, and the judge who teached us that told us it was copied from other European countries (which I do not remember). The idea is that, as you cannot be forced to reveal your password (because you cannot be forced to incriminate yourself) two laws are done for each IT-related felony. For example up to 2 years of prison if data is unencrypted and up to 5 if the data is encrypted. They offer you to be charged with the lesser one if you decrypt it yourself. The basic idea is that having encrypted the data probably indicates you knew the data was illegal (which is outrageous !). This is one of the terrible drifts law has followed on IT in the last years. Just as being blamed because someone uses a software you have done (e.g. P2P sharing) for something illegal (DRM violation). It is as if a knife-maker was accused of the crimes done with his knives !!! Thank you in any case for your HOWTO! Wonderful tutorial! I was successfully able to encrypt my usb drive in one go!